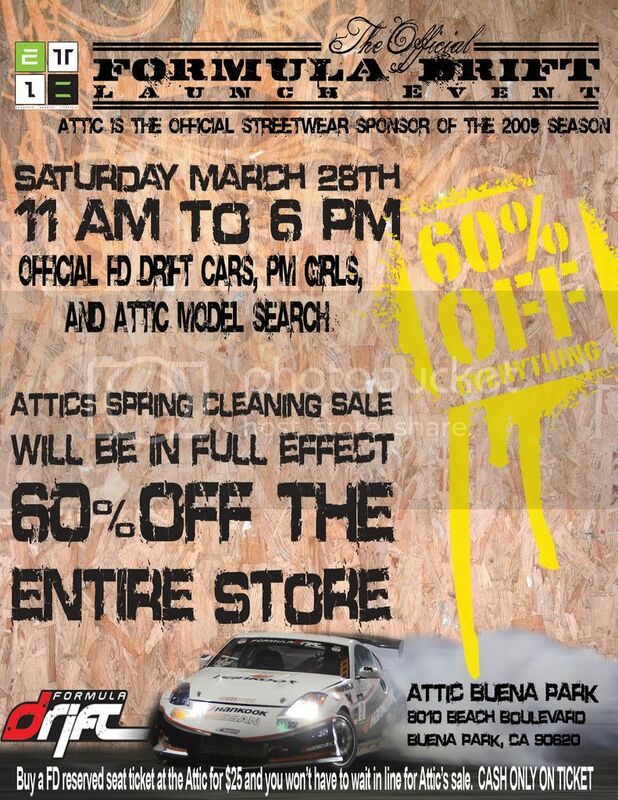 Attic is the official streetwear sponsor of Formula Drift’s 2009 season. This is the Official Launch event with Formula Drift to introduce the motorsports industry to the streetwear community and vice versa. • This Saturday (March 28th) from 12 PM – 6 PM at Attic Buena Park. The event starts at 12 Noon but the sale starts at 9 AM. • Formula Drift will be bringing out 5 of the drift cars that will competing this year to showcase. • Prestigious Models will be hosting the official “Ms. Attic” model search. They have a large database of amateur models they will be contacting for us to take pictures of at the event to find the official “Ms. Attic”. • Food will be catered by Kogi Truck. You’ve seen them on TV and in newspapers. • And finally, a massive 60% off sale to get a lot of you fans to come out to the event (must read details below to get the discount). This is one of Attic’s biggest sales of the YEAR. Our famous Spring Cleaning Sale. We made it very simple for you guys this time though. Instead of doing buy 1 get 1 free and stuff like that, we’re just going to give you 60% off your entire purchase. EVERYTHING in the store will be eligible for the 60% off (even sale items). Another added bonus is that if you purchase a Formula Drift Ticket ( Friday – GA Ticket & Saturday Reserved Ticket) for $25.00, you won’t have to wait in line for the sale! Tickets will be sold cash only and have a LIMITED Amount of Tickets, it’s first come first serve! THE MOST IMPORTANT PART: you will NOT be allowed to enter the store unless you show proof of text. In order to receive this text, you must text the keyword DRIFT to 69302. No exceptions. It’s really simple – just whip out your phone, send a normal text message to the number 69302, and inside the body of the text all you need to do is put the one-word keyword DRIFT and send the text message. It’s not case-sensitive so you don’t have to capitalize all the letters. If you have any questions, you can call the shop at 714-220-3116. This sale is for both Attic Buena Park and Attic San Diego, and the sale is from 9-6 on Saturday and 10-6 on Sunday for both locations.